ACTSI investigators and leaders Tabia Akintobi, PhD, MPH, associate professor, Community Health and Preventative Medicine, director and associate dean, Prevention Research Center & Community Engagement, Morehouse School of Medicine, and director, Community Engagement Research Program, ACTSI; Cam Escoffery, PhD, MPH, CHES, associate professor, Department of Behavioral Sciences and Health Education, Rollins School of Public Health, Emory University; and Michelle Kegler, DrPH, MPH, professor, Department of Behavioral Sciences and Health Education, director, Emory Prevention Research Center, Rollins School of Public Health, Emory University, and co-director, Community Engagement Research Program, ACTSI, were recently featured in the Journal of Georgia Public Health Association, for their work Assessment of the Building Collaborative Research Capacity Model: Bridging the community-academic research divide. Building research capacity spurs confidence and empowerment in communities that can then generate personalized health interventions that are more effective in improving lives. This research process was evaluated on a variety of scales, from longitudinal studies to qualitative reflections, with many more initiatives attempting to improve this precarious field of research. Unfortunately, these evaluations often fall short. Their methodologies do not properly encompass the increasingly complex relationships and power dynamics between researchers and CBOs. Success of CBPR involves the ability to navigate conflict, negotiate, and build consensus collaboratively. These healthier relationships produce research that is both culturally and contextually tailored to the communities, yielding enhanced recruitment and sustainability overall. 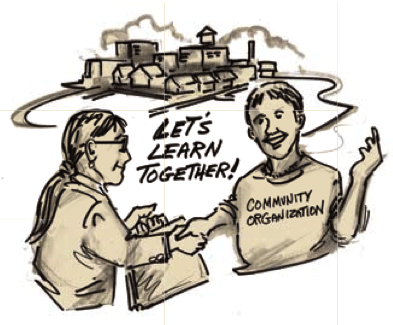 CBPR is the cornerstone of ACTSI’s Community Engagement Research Program (CERP). Akintobi, Escoffery, and Kegler sought to evaluate the strategies and outcomes of the Building Research Capacity Model adopted by CERP. The Building Collaborative Research Capacity Grant Program was designed to build the skills, values, and resources needed to engage partners equitably in the research process. This program also helped to build partnerships and fund pilot projects that could later be competitive for larger grants. This evaluation examined seven factors: human and fiscal resources, attitudes on collaboration, mutual respect between researchers and their community partners, partnering skills like communication and dependability, institutional factors existing within the two systems, shared goals, and research skills. Over two years, each CBO received $30,000 to develop a research plan for a pilot study, attend workshops on building research capacity, and implement a pilot study with an academic partner toward submission of a grant proposal. This grant program looked into four pilot projects with independent focuses, and their results were optimistic. Allocating funds to CBOs rather than researchers and building research capacity of the CBOs through training better addressed the power imbalances. Amongst three of the four CBO respondents, all areas of research capacity skills increased from pre- to post-training, with significant increases for community assessment and program planning. The training also enhanced skills in the systematic identification and prioritization of health issues, understanding theories that strengthen conceptual frameworks, and the development of evaluation approaches for research grant applications. The CBOs even reached out for advice from the researchers on projects extending beyond their currently funded program. CBOs suggested an adjustment involving the application of concept during training to open up discussion with their partners in terms of project design and implementation. The major drawbacks to this relationship were found more so on the institutional side, with concerns like IRB navigation that often delays the start of a project (and subsequent lethargy of the community after initial excitement has worn down). The IRB process ultimately was the most challenging, time-consuming, and deleterious piece of this project. The most successful projects were performed when the academic partner took charge of this aspect, educating the CBO while preparing the protocol. This better minimized CBO frustration with an otherwise unfamiliar process. This education has the potential to bolster CBO’s capabilities, moving towards their leadership of research rather than just advising and participation. The evaluation also found to have healthy dynamics across partnerships, with mutual respect at its core. The evaluation ultimately proved that the foundation of CBPR hinges upon shared goals, mutual respect, and positive attitudes toward collaboration. Finally, the study confirmed previous notions that context affects outcome in CBPR projects.